1) Apple fans rejoice at how amazing it is. 2) Android users laugh that they’ve had all those new Apple features since forever. What Android users fail to realize is that the iPhone is about more than just features. It’s about an experience. Here’s an example. After using my current iPhone 7 for about three months, the battery started to drain a little too quickly. I went into an Apple Store and they swapped it for a new one. Compare that to my experience with a recent non-Apple tablet. One of the buttons stopped responding to clicks after three months of use. It took me six weeks to get it replaced. Americas Cardroom is really a lot like Apple — at least from a customer experience perspective. We want people to be happy, which is why when we decided to postpone the last part (the Boss) of our OSS Cub3d after the Million Dollar Sunday (which still ran successfully in the face of DDoS attacks), we decided to come back bigger and better. 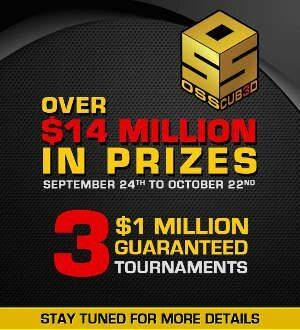 The OSS Cub3d runs September 24th through October 22nd with $14 million in guarantees — more than double the $6.7 million last time. And even more impressive? We’re hosting three $1,000,000 GTD tourneys, including two on the same day. That’s a Million Dollar Sunday on October 15th for $250+15 (half the regular price). Then a Million Dollar Sunday on October 22nd for the regular $500+40 buy-in, and another $1,000,000 GTD that same day for a high roller $2,100 buy-in. So get ready for the MOSS (September 24th through October 1st), OSS (October 4th to 15th), and BOSS (October 18th to 22nd) which has something for every type of player. With $14 million in guarantees, this is Americas Cardroom’s biggest series yet by far and they are going to make sure your online experience exceeds your expectations. Americas Cardroom has held 12 Million Dollar Sundays in their history with the last five exceeding the $1,000,000 guarantee. It’s all part of the $14 Million OSS Cub3d running September 24th-October 22nd! You can read our review of Americas Cardroom here. Join Americas Cardroom and play in all three of the $1 Million Guranteed tournaments! Find more information on Americas Cardroom and the best bonus codes to sign up with here.